20 petals for $1 - plus get an exclusive discount! For only $1, we will send you up to 20 petals of your choice, plus an exclusive discount code to be used for your full order. For a FREE sample, simply scroll further down this page. If you click on a photo, it will take you to that color's page, simply click the back arrow to return to your sample request. Please limit your selection to 20 colors. If you need a specific color that you do not see, please enter it here. All petals are stamped with a code for matching the color to the name. They are intended to be used for samples only, they are not suitable for decorative purposes. We also send you an exclusive discount to be used on your next order of silk rose petals. For only $3.95, we will send you one petal of every color we carry in our Silk Rose Petals, packaged in one of our organza bags. All petals are stamped with a code for matching the color to the name. Specialty and Aisle petals are not included in this sample, only those colors listed above in our Silk Rose Petals. They are intended to be used for samples only, they are not suitable for decorative purposes. We also send you an exclusive coupon included only with purchased samples. Valid for a limited time. To request a free sample of Silk Rose Petals, please use the form below. You may choose from up to eight of the colors, photos of each color are shown below (Floating and Heart shaped samples are not available). You will receive the petals via the US Mail in about 1 to 2 weeks. If your event is less than 2 weeks away, your sample will not be sent as there would not be enough time to receive it. 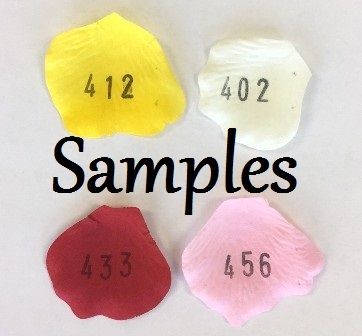 All sample petals are stamped with a large number code for matching the color to the name (see photo on left), so they are not suitable for decorative purposes. Included with your sample is a color key to match up the number to the color name. Mailing outside the US? Please order the $1 sample above. If you received a sample and need a new color key, click here to download one.